One of many cinematographers in Hong Kong that rarely or rightly never raised an eyebrow as such, same obscurity circulated around Ally Wong when turning director and it really is a trait that runs through the production too, with the sole shining star being cinema whore Simon Yam. Why even bother then? Watching To Where He Belongs, the final product is more than just a cheap way to spend 90 minutes. In fact, a triad movie attempting to portray its characters as wanting to break free, especially during this heyday of genre filmmaking, is interesting right off the bat. 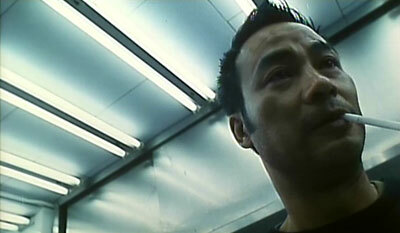 Although shot on a low-budget, Ally Wong uses the street level with fairly atmospheric results. Stuck in the regular triad story partly, it's there for design purposes to intersect with the wants of mainly three characters. So despite having scenes of triads drinking with girls in clubs, fighting with rival gangs over girls, dialogue about losing face, a certain main theme of loneliness begins to dominate. Despite the package not stitched up as such, To Where He Belongs transforms into a worthy study. With some immersing images of colours, playful angles and mobile camera work, director Wong still maintains as good focus on characters and one bit of heavy duty symbolism: a lighter. Representing Hui's break from the confines of the triad world and future dreams of flying away, it obviously sets itself up as not even semi-corny but dangerously corny. It's contrived to the max but somehow Jerry Chan's script is convincing in this regard when handled by Ally Wong. But To Where He Belongs does deal with a classic triangle of interests, one that is beginning to form as these rascals begin visiting places cinema doesn't usually take them. Meaning they display care, willingly takes those in need of it to hospitals and forgetting about the power struggles for a moment or two. The hospital is Gigi Lai's territory and around her illness-plot, she finds one willing to save her (Ma Chun-Wai's Fung), love her and one SHE is actually willing to love (Yam's Hui) but he's lacking in an initiative overall in this area even. 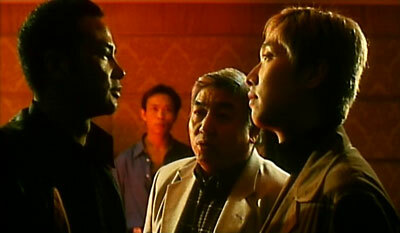 Wong's reverts attention to probably the bravest character choice at this time, the portrayal of Yam's Hui, a triad boss working out the rivalry in his own more sedated way. The flaw in him comes via a choice of sitting back instead rather than psychologically play the game and defeat after defeat generates doubts in his abilities, so much so that a follower changes gangs. The most human aspect of Hui's is that his eyes are open but he's mentally stuck. Claiming he's handling matters his own way, this lack of action has tragedy and fatal ends written all over it, especially in the light of dreams the lighter represents. Indeed unusually intelligent and layered material (thanks to nuances in Yam's solid lead performance) coming from a vehicle that played for 7 days in cinemas and probably was shot in that time as well but Ally Wong goes into To Where He Belongs with a certain confidence to deconstruct triad related matters in cinema. The stock scenes may be there (Ben Ng is particularly nasty in this one, force feeding urine and drugs into a character at one point) but the jump from clichéd content to connecting with themes of loneliness and future aspirations in peace works quite decently and the piece even injects quirky behaviour (followers forgetting to pay water bills, triad brawls with the regular people stuck in it and with the easily impressed children watching) to non-intrusive effect. It's therefore a noticeable blimp among the many cheap, sleep-inducing movies of its kind. This is a sleeper deserving of coming to life just a bit more though. Widesight presents the film in an aspect ratio of 1.71:1 approximately. Mostly free of wear, this is a rather weak transfer with boosted contrast, darkness and generally poor detail. Watchable for the cheap price however. Audio options are Dolby Digital 5.1 in Cantonese and Mandarin but as I'm not equipped with such a system, my assessment of this disc aspect will be left off this review. The imbedded Chinese/English subtitles are generally error free and readable at all times. No extras are included.